Upon ushering the Lady through Terra Cotta’s white trellis of an entryway, it feels a little like my grandmother has invited me over for dinner. Pink and mauve covers the walls and table cloths, a blend of wrought iron furniture and a stained glass window set a backdrop as the husband and wife duo who own the place both greet us. “Do you have a reservation?” the husband, Harvey Sturm asks. We do not, but the place is empty, and he therefore makes a little space. We often chuckle at such inquiries, given the clear availability of open seats, but before our appetizer arrives, a Dungeoness crab, artichoke and spinach dip plate beautifully presented, the place is already filling to capacity. 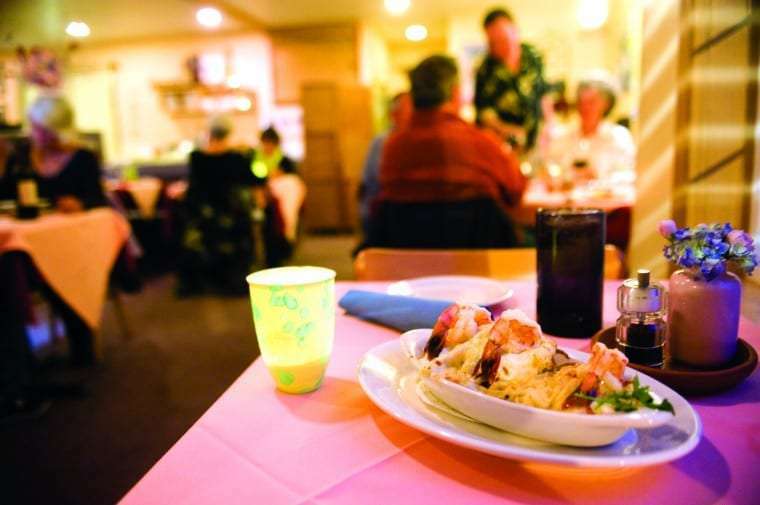 Bygone decor or not, Terra Cotta is one of the most romantic experiences available in Manzanita—save of course making your own meal on a sunsetting beach. Harvey presents the menu to you, including long winded descriptions that only truly fine meals should afford, elegantly and professionally, even in a polo shirt and golf shorts. A bottle of wine is produced, and shared over shrimp skewers and salmon en papillotte, where a slab of the local fish is steamed with apples and blue cheese and comes out steaming into the air between us. Every detail here has been purposefully chosen, right down to the bathroom with real hand towels instead of an endless supply of paper rolling out of some metal dispenser. On warmer nights, one could sit outside and enjoy anything from pork chops to sword fish, soba noodles to crostinis. The final touch though, is desert, the highlight of which was the Millionaire, a welcome finishing helping of Bailey’s, Grand Marnier and Kahlua, that comes with a side order of one Oregon Lottery Ticket. The Sturms gave us a chance a free meal, essentially, even if we came out on the Free Ticket end of the deal.